The Drugstore has been exploding with new products recently that has been getting me very excited but the only problem is my bank balance is low. Maybelline 24 hour tattoo - This is a cream eye shadow that is perfect as a base and to wear on it's own when your feeling lazy. At the perfect price of £4.99, this cream eye shadow is the perfect dupe for MAC paint pots and can create the ideal eye look with out the effort. Revlon Colour Burst Lip Butter - This lip butter comes in a range of colours and looks both nourishing and pigmented. The packaging also makes me super happy and with so many colours the only problem will be the great difficulty to pick up just one. 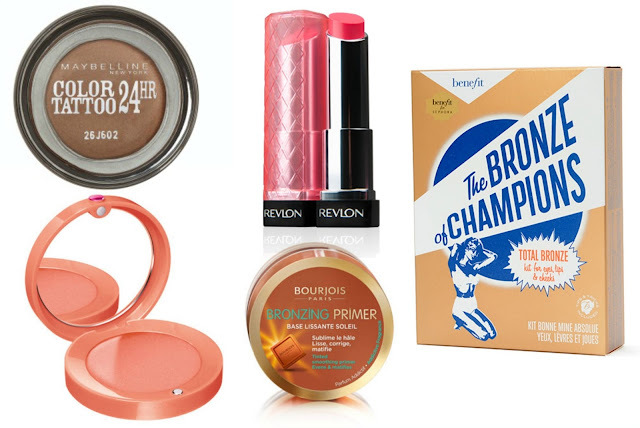 Benefit The Bronze Of Champions - I have been lusting over the new Benefit Kits for a while now. These kits are the perfect present, they are also great for beginners for example the Bronze Of Champions could be perfect for a beginner in bronzing. I just love the retro packaging of these kits but they are quite expensive at £26. Bourjois Bronzer Primer - This bronzing primer is meant to act as a base for your bronzer but I have read that it is just perfect for a cream bronzer. The cream aspect of the bronzer kind of scares me but taking risks is sometimes good. Bourjois Cream blusher - There is a constant theme with cream products in this wish list but there is so many new cream products out there right now that I need to own. These Bourjois cream blushes are a big hit with the blogging community and I want to see what the fuss is about.